For this month's "Maps of the Month" featurette, I wish to draw your attention to Dan_'s King's Quest V: Absence Makes The Heart Go Yonder (PC) maps. After two years of recognizing great maps, we only had one map set for the PC that had received the Maps Of The Month honour. So it's about due time for another one. And so why not one from another historically pivotal series? Sierra Entertainment is probably best known for their series of PC adventure games. There's King's Quest, Space Quest, Police Quest, Quest For Glory, Leisure Suit Larry, and all of the aboves' numerous sequels, as well as the Dr. Brain games, the Eco Quest games, and more! If you are old enough to remember a time when PC games weren't all first-person shooters, real-time strategy games, or massively multiplayer online RPGs, then you should have at least played one of these. King's Quest in particular is the original series, and its first game was a ground-breaking step up from text adventure games. Sure, the early games still had a typing interface for commands, but soon in all of the Quest games you were playing all the way through just by using the mouse. Of the King's Quest games, the fifth one is visually remarkable and fairly epic. The hand-drawn graphics (and the series itself, arguably) were at their peak at about this time. From cozy Serenia, this adventure will take you (and King Graham) through a scorching desert, a snowy mountain, a vast ocean, and the downright creepy castle of Mordack's...and all the while you'll be remarking at how good 256-colour VGA graphics can look. Dan_ didn't play favourites, though, as he mapped all of the first six games completely, and in mere days, by starting another one immediately after finishing another. 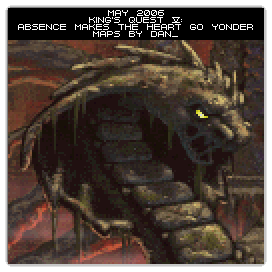 As VGMaps.com can only honour one at a time, we'll go with King's Quest V.
So to recognize the effort put into making these picturesque maps, Dan_'s King's Quest V: Absence Makes The Heart Go Yonder maps will be known as VGMaps.com's Maps of the Month for May 2006. I've never played a single game from that series, but I've looked at all the maps. They just look so good. Congratulations, Dan_!